EUROJET Turbo GmbH, the consortium behind the EJ200 engine system, will be showcasing the EJ200 engine at IDEF in Istanbul this May. EUROJET believes the EJ200 is the best solution for Turkey’s TFX indigenous aircraft project, the engine’s advanced technology combined with a cost-effective operational and maintenance philosophy making it a highly competitive option in the TFX competition. A close cooperation between airframe and engine companies is essential to ensure a 'perfect marriage' between these two essential components and EUROJET has a long history of successful partnerships and is keen to offer its experience and technology to the Republic of Turkey. EJ200, sade motor mimarisi ve yüksek itme gücü - ağırlık oranı ile bugünün muharebe uçaklarının en zor harekat ihtiyaçlarını karşılayacak şekilde tasarlanmıştır. EUROJET olarak EJ200’ün bugün var olan en güvenilir savaş motoru olduğuna inanıyoruz. EJ200, pazarda mevcut olan kendi sınıfındaki diğer muharebe motorlarına oranla daha iyi performansa, daha düşük ağırlığa, daha fazla güvenilirliğe, daha küçük boyuta ve daha iyi menzile sahiptir. EUROJET Türkiye Cumhuriyet’in TFX projesini ve yerlileştirme hedefini tamamen desteklemektedir. Bu kapsamda özel bir yerlileştirme konsepti geliştirmiştir. EUROJET, Türkiye’nin TFX hakları kendisine ait olacak şekilde ihracat taleplerini desteklemekte ve bu kapsamda ihracat gereksinimlerini göz önünde bulundurmaktadır. Aynı zamanda belirli gereksinimleri karşılayacak şekilde mevcut EJ200 motorunu değiştirme / geliştirme ve uyarlama fırsatı ile birlikte teknoloji paylaşım paketi sunmaktadır. Bu husus özellikle Türkiye Cumhuriyeti’nin uzun vadeli istekleri açısından oldukça önemlidir. EUROJET – the cornerstone of cooperation between four global market leaders in the aero engine industry, Rolls-Royce, MTU Aero Engines, ITP and Avio Aero, has been pivotal in creating the world’s most advanced 4th generation military turbofan – the EJ200. The ground breaking technology evident in the EJ200 engine is best witnessed by the astounding performance of the Eurofighter Typhoon aircraft which is fitted with two of these spectacular beasts. 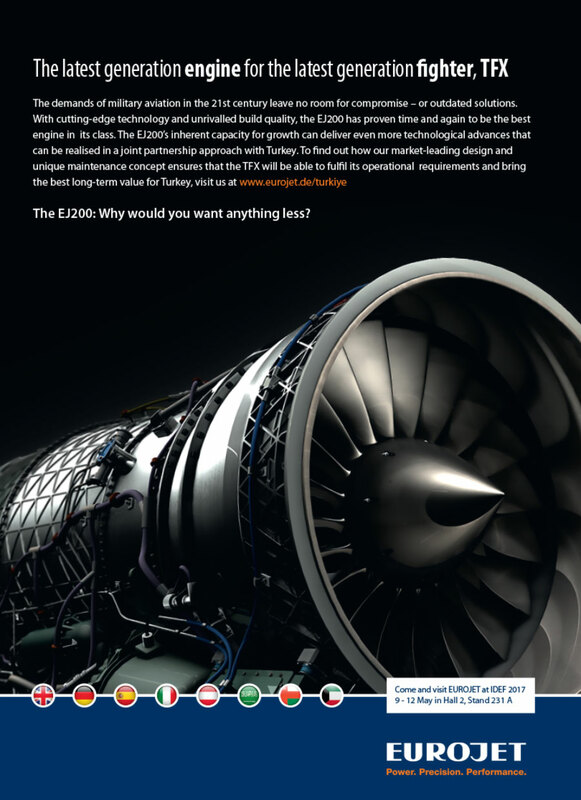 EUROJET manages the entire EJ200 project from inception through production, support and export. The EJ200 is designed to fulfil the most demanding requirements of today’s fighter aircraft, delivering a high thrust-to-weight ratio combined with simple engine architecture. The EJ200 is a two-spool turbo-based fan with modular design which allows for maximum availability and minimum operating costs throughout the life of the weapon system.